UPS Education providing a supportive, student-centered learning environment, which enables students to meet their educational and career goals and achieve positive learning outcomes. 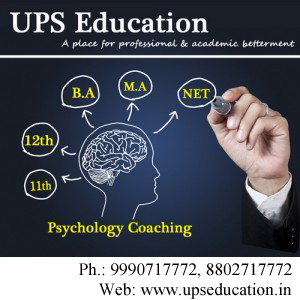 UPS Education provides Psychology Coaching for MA Entrance, NET Entrance, BA & MA Psychology coaching and all other Psychology Entrance Examination. Area Covered: Paschim Vihar, Jwala heri, Peeragadhi, Punjabi Bagh, Raghubir Nagar, Paschim Puri, Rani Bagh, Multan Nagar. Nangloi, Kirari. This entry was posted in approaches of psychology, best psychology coaching classes in delhi, Best Psychology Institute, CBSE NET Psychology Coaching, M. Phil Clinical Psychology Coaching, MA Psychology Coaching, NET Psychology Coaching, UGC NET Psychology Coaching on October 31, 2015 by UPS Education. UPS Education is just started a new batch for NET Psychology Entrance, MA Psychology Entrance and M.Phil Psychology Entrance Examination of 2015. Come and Explore Your Psychology with UPS Education. Address: – A-87, Madipur, Near Madipur Metro Station, New Delhi-110063. This entry was posted in approaches of psychology, best psychology coaching classes in delhi, Best Psychology Institute, CBSE NET Psychology Coaching, M. Phil Clinical Psychology Coaching, MA Psychology Coaching, NET Psychology Coaching, UGC NET Psychology Coaching on October 30, 2015 by UPS Education. 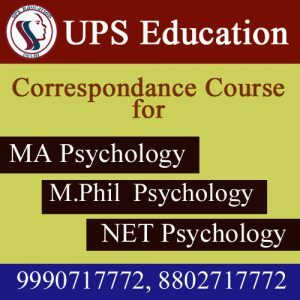 UPS Education offers their special course for those students who want to qualify the NET, MA and M.Phil Psychology Entrance Examination of 2015. We also designed unique and different course for DU [Delhi University] Entrance Exams of 2015. Gold Medalist faculty, well researched Notes and benignant infrastructure make us different from other. Join us as soon as possible, if you want to crack NET, MA and M.Phil Psychology Entrance Examination. This entry was posted in approaches of psychology, best psychology coaching classes in delhi, Best Psychology Institute, CBSE NET Psychology Coaching, M. Phil Clinical Psychology Coaching, MA Psychology Coaching, NET Psychology Coaching, psychology coaching class, psychology coaching in delhi, UGC NET Psychology Coaching on October 29, 2015 by UPS Education. 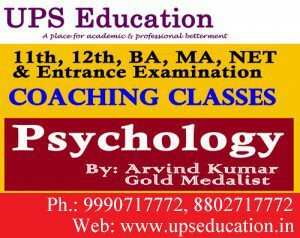 UPS Education Renowned for Psychology Coaching in Delhi. UPS Education providing a supportive, student-centered learning environment, which enables students to meet their educational and career goals and achieve positive learning outcomes. 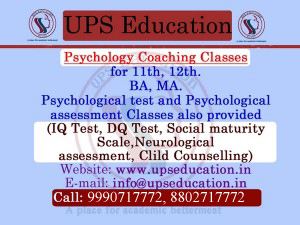 UPS Education provides Psychology Coaching for MA Entrance, NET Entrance, BA & MA Psychology Coaching and all other Psychology Entrance Examination. This entry was posted in approaches of psychology, best psychology coaching classes in delhi, Best Psychology Institute, CBSE NET Psychology Coaching, M. Phil Clinical Psychology Coaching, MA Psychology Coaching, NET Psychology Coaching, UGC NET Psychology Coaching on October 28, 2015 by UPS Education. Delhi is a first destination for those who want to do (Post Graduation) MA in Psychology because there are India’s top 2 Central Universities Delhi University and Jamia Milia Islamia University. And Ambedkar University also is the good option who wants to pursue Master Degree in Psychology. There are also Good Coaching Center who provides Coaching for Psychology Entrance like UPS Education. Lots of Students come across the country to take coaching in UPS Education. According to the Director of UPS Education, who want to crack the Entrance of these university they need to be focus and Study systematically. All these universities have different pattern of Entrance Examination but students need to be very objective when they study theoretical Concept. Area Covered: Paschim Vihar, Jwala heri, Peeragadhi, Punjabi Bagh, Raghubir Nagar, Paschim Puri, Rani Bagh, Multan Nagar, Uttam Nagar. This entry was posted in approaches of psychology, best psychology coaching classes in delhi, Best Psychology Institute, CBSE NET Psychology Coaching, M. Phil Clinical Psychology Coaching, MA Psychology Coaching, NET Psychology Coaching, UGC NET Psychology Coaching on October 26, 2015 by UPS Education. UPS Education is the best Coaching Center for NET and MA Psychology Entrance Examination. UPS Education is the best coaching center in Delhi NCR. Many Student Qualified NET. 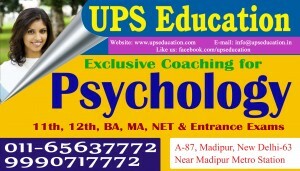 UPS Education Offer some courses for aspirant who want to crack NET and MA Psychology Entrance. UPS Education is one of the top destinations for NET and MA Psychology coaching where student can nourish their theoretical consent as well as practical. Area Covered:- PaschimVihar, Madipur,MultanNagar,RaghubeerNagar,JawalaHedi, Uttam Nagar, PaschimPuri, Rani Bagh, Punjabi gh, Nangloi, Kirari,PeeraGhari. 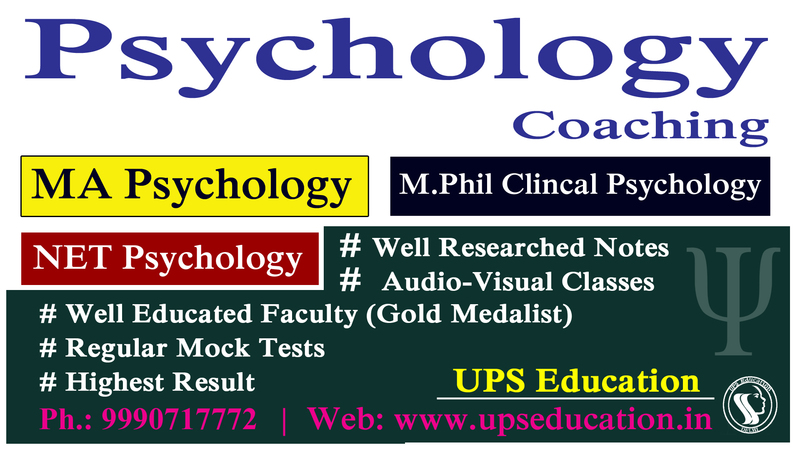 This entry was posted in approaches of psychology, best psychology coaching classes in delhi, Best Psychology Institute, CBSE NET Psychology Coaching, M. Phil Clinical Psychology Coaching, MA Psychology Coaching, NET Psychology Coaching, psychology coaching in delhi, UGC NET Psychology Coaching on October 8, 2015 by UPS Education. I was concern about my NET Psychology coaching. I searched lots of coaching center but i decided to join UPS Education because teaching method of Arvind Sir is quite different and very attractive. Arvind Sir is Gold Medalist and also he is very supportive. Staff of UPS Education is also very supportive, they are always stand for us UPS Education is the best place for National Eligibility Test [NET] Psychology Entrance coaching. This entry was posted in approaches of psychology, best psychology coaching classes in delhi, Best Psychology Institute, CBSE NET Psychology Coaching, M. Phil Clinical Psychology Coaching, MA Psychology Coaching, NET Psychology Coaching, psychology coaching class, psychology coaching in delhi, UGC NET Psychology Coaching on October 7, 2015 by UPS Education. UPS Education is the Leading Institute and Coaching center in Delhi. UPS Education provides Psychology Coaching in New Delhi. We Ranked Top in Psychology Coaching by Some Educational Website. We Offer Academicals and Entrance Coaching for Psychology. UPS Education Provide Psychology Coaching for Delhi University (DU), JamiaMilia University, Ambedkar University (AUD), and Indira Gandhi National University (IGNOU).UPS Education provide Theory Classes as well as Practical Classes. Area Covered:PaschimVihar, Jwalaheri, Peeragadhi, Punjabi Bagh, Raghubir Nagar, PaschimPuri, Rani Bagh, Multan Nagar, Uttam Nagar. 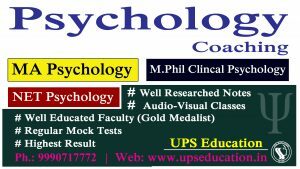 This entry was posted in approaches of psychology, best psychology coaching classes in delhi, Best Psychology Institute, CBSE NET Psychology Coaching, M. Phil Clinical Psychology Coaching, MA Psychology Coaching, NET Psychology Coaching, UGC NET Psychology Coaching on October 1, 2015 by UPS Education.